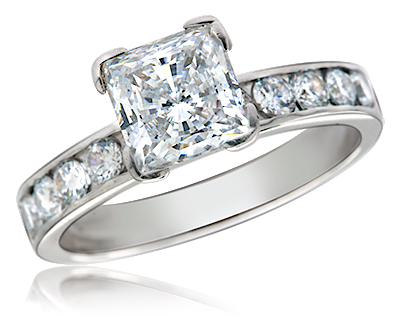 The Bellevue Princess Cut Cubic Zirconia Solitaire Engagement Ring With Channel Set Rounds features a 1 carat 6mm princess cut square center stone. 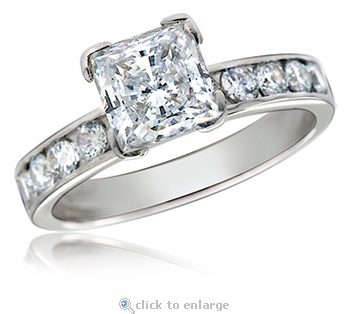 Five additional 2.5mm brilliant round diamond look cubic zirconia line halfway down both sides of the shank to beautifully compliment this solitaire engagement ring's original Russian formula cz princess cut square. This ring would serve well as an engagement ring and you can add a band of your choice to make a beautiful wedding bridal set. 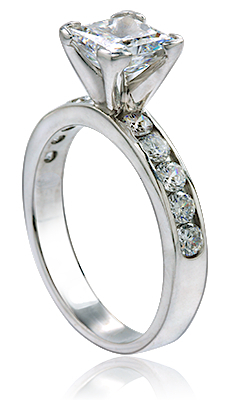 All our stones are hand cut and hand polished to exact diamond specifications and includes a lifetime warranty. The Bellevue Solitaire Engagement Ring includes approximately 1.8 carats in total carat weight of the finest diamond simulants and the shank measures approximately 3mm in width. The ring is shown here in 14k white gold but you can have this ring made in 14k yellow gold, 18k gold or Platinum via Special Order.